Today in AP Physics 2, groups shared their results from yesterday’s fluid paradigm lab. The groups investigating pressure vs. volume of fluid above a point or pressure vs. depth in fluid were confident that the pressure at a point depended on the depth below the surface of the fluid and not on the volume of fluid above that point. They had sufficient data that they were also confident that there was a linear relationship between pressure and depth. 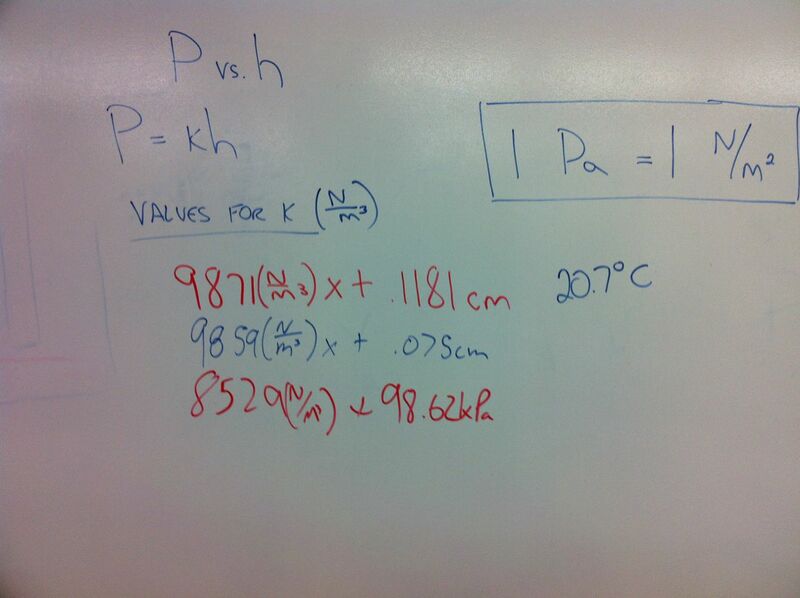 The groups that investigated pressure vs. fluid density at constant depth/volume had inconclusive results. The pressure they measured varied by less than 1% between the three types of fluids. This provided an opportunity to discuss how the experimental technique can affect the uncertainty of the measurement. We discussed that with the new understanding of the relationship between pressure and depth, these groups could gather several measurements at various depths in each of the three fluids and compare the slopes of the resulting graphs to see if density has an effect. While we were discussing measurement uncertainty, we also discussed how the depth is defined not by the position of the bottom of the glass tube, but the water level within the glass tube. While the groups investigating the effect of fluid density on pressure applied their new experimental technique, the rest of the groups repeated gathering pressure vs. depth data while carefully examining the fluid level in the glass tube. For homework yesterday, I posted a link to the four-step Plotly tutorial on linear fits. All students were able to create graphs in Plotly. However, what confused several groups was that Plotly reports the equation of the line of best fit as y = a + bx, and these groups assumed the coefficients were in the form of y = ax + b. That lead to some confusing results at first. Some groups are still finalizing their analysis, but three groups in one class reported their findings for the mathematical model of pressure vs. depth for tap water. We need to work on units (check out the units on the vertical intercept) and investigate the cause of the error in the third equation (at least they have the proper units for their intercept).